Hi all, I'm back with another no-sew quiet book page and template from my niece's epic no sew quiet book! 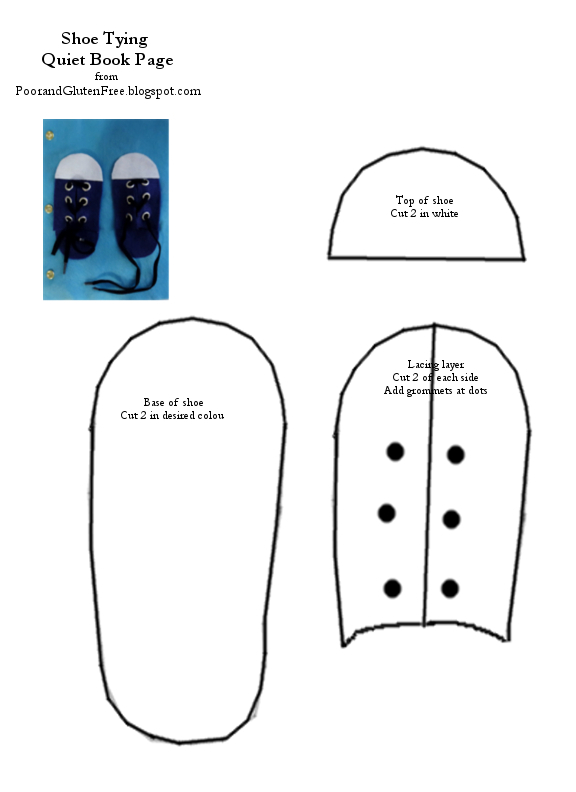 This week I'm sharing a FREE template and tutorial for a shoelace tying page. 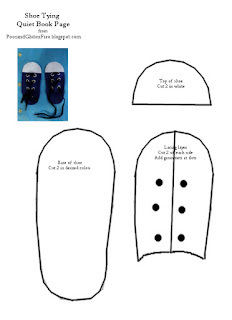 This one is pretty simple, as there are not that many little bits, and it's a nice one for little kids to practice fine motor skills and shoe tying. 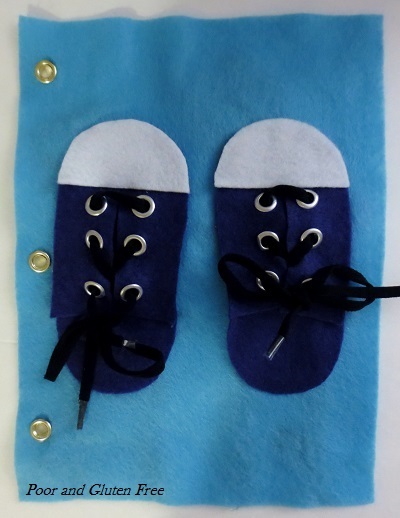 For tips on cutting felt and keeping organized, see My First Quiet Book Page Post. Cut out all the shoe pieces from the paper. 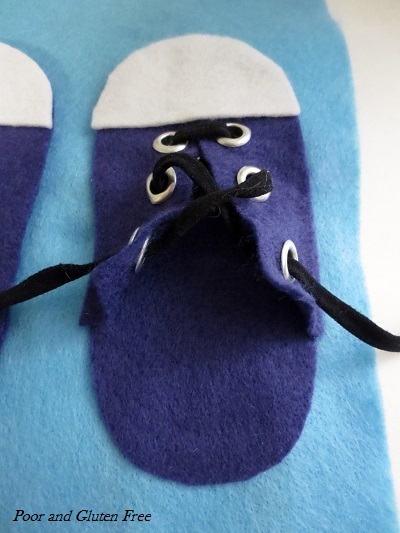 Cut out 1 shoe base in felt, then flip the template over and cut out the opposite side. Do the same for the laces layer, and cut two of the top layer. Add grommets to all 4 lacing pieces prior to gluing. 1) Glue down the two shoe base layers in the centre of the page. 2) Glue the lacing layer down by gluing around the top and sides only, so that the lacing layer looks like the above photo. 3) Glue down the top white layer of the shoe completely. 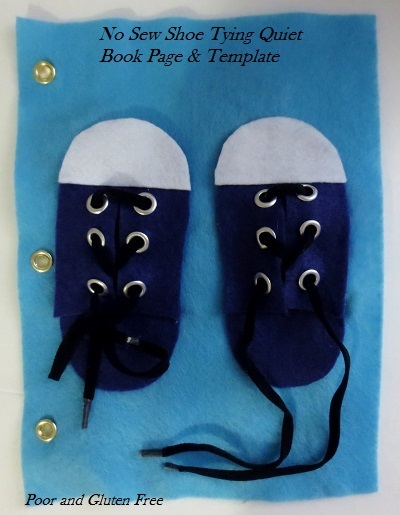 4) Add laces, optional grommets on the side to bind the page into your book, and you're done!! Next up is the flower and button page! In the meantime, have you seen the latest novel in my romance series, Lady of the Caravan? 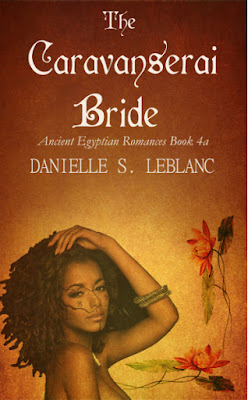 Get it now, and follow the queen's cousin as she braves the dangers of Egypt's great desert to marry a nomadic chieftain.